Are you working hard to grow your dairy, but it’s happening at a snail’s pace? With the growing awareness among people, many farmers are showing more interest in dairy farming. Most of them take over the ownership from their parents or grandparents. Regardless of the background and experience you have, there are many things to be taken into consideration to grow the dairy business and make it a successful venture. Dairy Business is a profitable venture provided the person is aware of what he is doing and how to take care of cattle. Dairy farming requires enough resources, capital and adequate land for keeping the desired number of cows. It also involves growing good quality fodder, grasses and legumes to feed the cows sufficiently. You should be prepared to have enough food to feed the cows according to the requirements during winter and dry season. Besides the mentioned elements, the budget also plays a vital role in planning and growing your dairy in a profitable way. Every cow should be given necessary nutrients, vitamins and should be properly fed. Every dairy business should have a Fatomatic which is a fat measuring machine. It helps the farmers to know the fat amount in the milk and if it is less than desirable, it means that the cow is malnourished. In this way, farmers can increase the diet of cattle to enhance milk quality. On the decision to grow a dairy farm, you should gain adequate skills in managing the dairy cows regardless of the counts. One can gain the knowledge and experience by working with experienced dairy farmers or with livestock extension personnel. 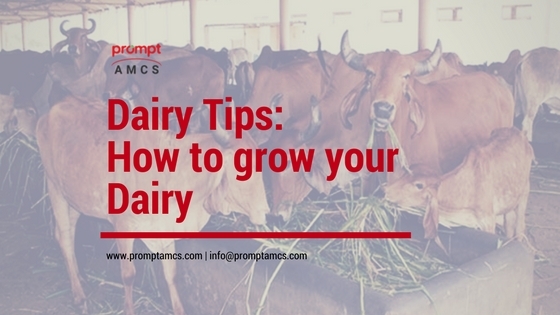 This attempt can help you avoid costly mistakes and losses while making your venture in dairy farming profitable. In most of the towns, a liter of milk is sold at Rs.40 on an average. Assuming if you have six dairy cows and each is producing about 25 liters of milk per day, what adds to get 150 liters of milk per day? This sums up a gross income of Rs.6000/- per day and Rs. 180000 in 30 days. However, if you deduct the expenses, the cost of feeds, supplements, medications, labor and other expenses, you can make a profit of Rs. 125000 per month. This is quite a good income, which you can accomplish from a successful dairy farm. With young personnel striving hard to complete their education and working for Rs.10000 or even less per month, rearing livestock can bring them amazing income, which will also encourage the agricultural sector in India that has taken a back seat. There is no doubt that such attempts made by young men and women in India will not only make the country progressive but will also grow the agricultural sector in India. Change in weather: Like humans, cows also get affected by changes in weather conditions. Their food requirements and other essentials vary according to change in seasons. However, regardless of the weather condition persisting, keeping the cows warm and healthy is very important to grow your dairy. Keeping them clean and dry is also very essential. Although cows mostly eat grass, there are also man-made supplements given to them to produce nutritious milk. Generally, cows survive on the grass, however, with the agricultural produce reducing in recent days, they tend to depend on artificially produced supplements for extra food. Hay: This is the best option for those who cannot spend on alfalfa which is expensive. Oat and wheat hay are affordable, and they are also a good option to meet the supplementary requirements of the cows. Silage: This is a very common option farmers choose to feed their cows. It is a high-quality feed for the cows, and some of the options include silos, haylage, and others. Grains: Grains meet the nutritional requirements of cows. It is the highest energy food with high nutritive value. Although cows consume grains naturally in the wild or farm lands, meeting the required amount is important on which the farmers should focus to fulfill by providing extra grains. It is important to focus on the health condition of the cows in your farm, especially during the winter season. Winter season is difficult for them for the obvious reasons, and if they are bathed it is essential to dry them, otherwise, they will fall sick or catch diseases. Besides, maintaining the cows in good and nominal weight is very important to ensure their health. It is recommended to assess the cows once in every two months. It is also equally important to maintain the body fat level, which can be increased or decreased by feeding appropriately. Physical Activity of cows is very important to keep them healthy and increase dairy production. Try to give the cows a little push in the morning and give them hay to get warm. Feed them enough in the morning with all nutritious foods. Sitting in the shelter all day will make their bones weak, so one should leave them in open fields twice a day as it keeps them active. Doing so also gives the cattle some fresh air to breathe. It is normally observed in the dairy business that people lock the cows back in godown or build a hall and keep dozens of cows in a single hall. Building a proper shelter also plays a crucial role in growing dairy. The shelter you develop should also ensure maintaining appropriate weather condition indoor, both during summer and winter. Try to keep the place warm and dry to make the cows feel comfortable, and there should be a separate shelter room for pregnant cows with continuous availability of food and water. This is very important. Try to ensure that their teats are dry, especially when leaving the milking stall or feed area. If their teats are dirty and not properly washed, it can catch the infection, itch them and also affect the quality of milk. So for a healthy and long life of your farm animal and adequate supply of milk, it is essential to keep their teats clean and dry as the cooperative societies and dairy farms have milk analyzer that can easily determine the quality of milk. In addition to the above-stated tips and guide to growing dairy in a profitable way, it is also important to develop a detailed business plan. Adopt appropriate ways to market the milk produced. Try to hire the right people who are not only dedicated but experienced. Try to buy bulk feeds at the best prices, however, never compromise on the quality. Moreover, try to reduce your unwanted expenses when attempting to grow dairy farm.